Your place for wedding planning. Great wedding ideas. The key to a successful and perfect wedding ceremony is the planning. Since small things may go wrong on this big day, but if there is a proper plan, you can ensure that everything is flawless. You can create one as soon as nuptial date is fixed and follow it. 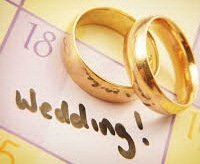 However, you should organize every aspect of your life to make a successful wedding plan. Thus, you will not only be able to save yourself from stress, but also keep the budget maintained. You will have to work hard a little in the beginning as you will have to decide the required and unnecessary things at each stage of planning, but later, you will praise it when the ceremony is organized successfully. Some suggestions are mentioned below which can help you stay organized at each stage of wedding planning. The first suggestion is to purchase a notebook or use the personal computer for creating a list of all important tasks. In the beginning, you should list all the tasks and sort these according to their priorities. You can also mention deadlines for all and cross these once completed. The dates of completion must be according to the wedding date. However, you should try to avoid doing the most important things in the last few weeks. You can also allocate a day to take a look at the accomplished and remaining tasks if you want. If you do not wish to forget the important dates such as the day to pay for wedding venue, you can set up a reminder in the mobile phone. An important part of staying organized is realizing that you cannot do everything on your own. If you try to do the tasks others can help with, the tasks will be delayed. Therefore, you must make a list of all these tasks. In the notebook you used for doing the above tasks, mention all wedding vendors with their address and contact details in a list. It will make it easier to access information about a particular merchant whenever you need. If you have not finalized the vendors yet, you can also include them in this list. Later, you can make a separate list of the finalized ones. While making a list of vendors, you can also mention the different wedding items such type and design of invitations, size of dress, flavor of cake, and many more. Every time you purchase any item, you should keep it in one place. Thus, you can easily find required items in case of need and avoid buying things multiple times. Since it is easier to get confused between already purchased and still to purchase things, but you can avoid this by keeping all of these in one place. Well, you are now well familiar with the best way to organize your life while planning your wedding. You can use these tips and your knowledge to stay organized and avoid missing any important thing. Author is an online marketer and he is passionate about writing articles about different topics. Nowadays, he is sharing suggestions related to purchasing best Indian wedding cards and other aspects of marriage planning.